He is one of the most respected Kata Coaches in the World Karate Federation community, not only for his insight in the sportive aspects of elite competition but for his deep knowledge of the traditional techniques as well – a coveted perfect balance hard to achieve. “There is so much here that athletes can take home to their own practice of the sport. Most notably that it is our love of karate for its own sake, rather than our desire for a medal or a trophy, that really makes us champions,” he says. In this exclusive interview with USA KARATE magazine, Sensei Del Moral shared some of the insights used in the training of some of the best kata athletes in the world. He also reveals many little-known facts about his personal life, view of the sport and the art of karate. Some say that he is the obsessive, that he studies and works non-stop trying to nd the best way. His athletes say that he demands a very high standard of near-perfection. Many in the sport seem to think he is a motivational guru. Perhaps it’s best to just look at the evidence. “Do it again,” Sensei Del Moral tells to one athlete getting ready for the World Championship. Do it again. Do it again. Do it again. Tell me about your first memory of Karate training and why did you start karate? I started practicing karate when I was very young but to be honest, I could have started to train in any other martial art style. I loved the Kung Fu movies and of course, Bruce Lee. My brother and I used to go together to the summer theatres and as soon as we got back home, we tried to duplicate the movements we just saw in the movie! I was around 6 years old at that time. One interesting thing occurred one day while we were going back home. On our way back, we were stopped by a group of guys asking us for our money. I got into a ghting position right away without realizing that my brother was yelling at me, “run, silly, run!” from 20 or 30 yards away already! I often remember that moment, and I think, in many ways, I am still the same innocent guy who “took the fighting stance” that afternoon! After a while, I started to ask my parents about taking martial arts classes. They signed us up for Judo but I wanted something different. After looking around, I’ve found a karate school that I joined. I had a lot of passion about it and couldn’t wait to go to class everyday. As soon as I could get a little more freedom to move around the city, I joined Sensei Yashunari Ishimi dojo. He truly became a turning point in my karate journey. I started to meet other teachers, not only from the Shito Ryu style but from many different disciplines and the methods. Many trips to Japan, Okinawa, China, etc… made me realize how little I know and how fortunate I am having access to these great masters who are willing to share their knowledge and experience with me. What is your single favorite memory of your career and why? I could share many stories but probably the most rewarding, as a Karate teacher, is to see how old students of mine are bringing their children to train with me. A very special one is when my daughter passed the black belt test under the National Federation in Spain. I wasn’t there and she knew how much that meant to me. And last but not least, to see Sandra winning her first National Championship. It was the beginning of a long journey that still continues. How and why did you get involved in coaching? It was at a very early age. At 14, I started to help my teacher in the kid classes. Later on, I went through all the requirements and Coaching ranks by the Spanish National Federation required to become a teacher and a coach. Once I realized that it was that what I really wanted to do for the rest of my life, I began to expand my education and studied Physical Education, Personal Training, Sport Coaching Science, Sport Psychology, etc, in order to “invest” in myself as a professional Coach. Eventually, I opened my own school and it was there where I could finally combine the two things that I like the most: teaching karate-do and the elite competition training and coaching. You were hired by United Arab Emirates to teach karate in that country, what is your favorite part about living there? It was an amazing experience that lasted over 3 years. I did learn a lot and it was for me a phase of personal introspection and development. I had a lot of time and I focused on developing a specific methodology and protocol for elite Kata competition. I had the time to focus on Sandra Sanchez’s development for competition and build a solid training program involving all the aspects of elite physical conditioning and traditional karate kata. Of course, I enjoyed the free time, a free time that allowed me to do other things like reading and continue my personal education. You are the coach of two number 1 kata athletes in the world ranking: Sandra Sanchez and Damian Quintero. What is that part of their coaching that you enjoy the most? It is a pleasure to coach and train these two elite athletes. They are some of the very best in the world. Their dedication and pas- sion is second to none. They give their best in every practice session and are always looking for new ways to get better and raise their level of performance. Every Coach has to be a sort of a psychologist, a sensei, a friend, a personal trainer, etc… it is the combination of many aspects that a coach has to balance and coordinate to get the best results from the athlete. It is very rewarding for me to watch them training every day. They are really impressive. I feel very proud and at the same time very humbled. The rules in WKF kata competition have changed a few times in the past. How do you adapt to the changes of the rules and how do you coach the athletes to focus on these aspects? I have to say that I liked the old [point] system more. I believe the system was more fair but maybe less attractive for the spectator. When the system was changed and became divided in three aspects: technical conformity, technical level and athletic level, we had to re-structure the way we work on each individual aspect in order to reach the highest possible level for each. It is true though that the referee gets a general view of the athlete’s performance and does not goes in depth on each aspect. We work hard on the audible cues, the breathing, etc… all these aspects are very important at elite level. We focus on the physical aspect, obviously but always maintaining the perfect technique. One of the most difficult aspects of coaching is managing the stress associated with large competitions. Can you share with us some of the things you would do to calm your athletes before competing? The mental aspect is extremely important when two athletes are at the same level. The winner will be the one who better controls their emotions and feelings. As a base, I have developed ways of visualization, breath control and methods for immediate relaxation; I have developed protocols of action for different situations so they know what to do when things are not going the way we expected. But I’d like to add that the most important thing is for the athlete to know that they must give their 100% in every practice, every day. When you give your best every day and put all your heart and mind in what you are doing, the results will come. What expert advice can you give to other coaches about how to deal with pressure while coaching at such a high level? Pressure will always be there! Pressure is good! Use it to improve! What it is important is to know how to guide the athlete to reach the correct level of activation in order to perform their best. That’s the key! Over thinking about the mistakes we did in the last championship won’t help us at all. Don’t ruin your present with mistakes from the past that have no future! Don’t worry about who you are going to face in semi-finals or the final. We must focus on “here and now”. This round. That’s all. Give the best on each round. Don’t “save” anything for later rounds…that’s suicidal in today’s competition. I always tell them: “Go out there and do your best! Whatever will be…will be!” Do your best and the rest….will be alright. Now you are the National Coach for Spain, in the last European Championship in Turkey, Spain took gold medals in Individual Male (Damian Quintero), Individual Female (Sandra Sanchez) and Male Team, with a bronze in Female Team. What protocols are you using to achieve this exceptional level and results with the kata athletes? Maybe the real secret is that there is “no secret”! We work very very hard. Extremely hard, I must say. We dedicate all our time to study, improve and work toward one single goal. Honestly, I don’t know any other way to achive what we have achieved. We plan what are we going to do, find the best way to do it, and do it; not holding anything back. Without plannification and hard work there is no success. But allow me to say that hard work must be invested in the right direction. There are many other countries that are working very hard and that pushes us even more! You use very specific training methods developed from a professional Strength and Conditioning approach matching the art of karate. Can you walk us through what a typical training session in as much detail as possible? We practice 5-6 hours per day. This training is divided in two sessions, morning from 10am to 1pm and afternoon from 3pm or 4pm to 6pm or 7pm (depending of the season). 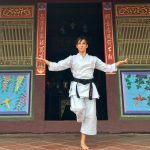 In the morning session we focus on technique, specific kata training and physical conditioning (usually, we dedicate one hour for each element depending of the training cycle). During the afternoon sesión, we work more specifically on kata, flexibility and injury prevention. 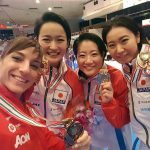 How much physical conditioning does a modern athlete needs to become a world kata champion, is it not only about technique? In elite competition nowadays 50% is technical work and the other 50% to the physical aspect and what I like to call “the invisible training”. I think that many people train the physical part but they don’t have the right protocols, the proper methodology and they don’t know how to make these aspects to work together in order for one aspect to improve the other. It is not as simple as it sounds though. Definitely not when what you want is to have an European, a World or an Olympic champion. How much do your top athletes train per week? How many hours and how do you divide the training time? The members of the National Spanish Team train 5-6 days per week and around 5-6 hours per day. The 50% of the training is exclusively technical training for kata; 40% is dedicated to the physical and conditioning aspect and the final 10% to injury prevention and physical recovery. Depending on the day of the week, the month and the date of the championship, we adjust training, loads, intensity and volume for each training session. What kind of mental preparation do you have your athletes undergo leading up to major competitions? On a second note, I focus with them on controlling the breathing patterns and the element of relaxation. I have developed protocols for stress and pressure control and different levels of activation. And last but not least, I work on visualization of certain circumstances in order to better control them if they happen. What do you think is the proper way to coach an athlete in the final moment of a European or World title final match? The most important thing right before the final is to give them confidence and serenity. I remind them how hard they have worked to be there and that now all that they have to do is to put all their heart and feeling in the kata. The work that has already been done. What is the most important piece of advice you can pass on to kata competitor breaking into the world kata circuit? I think the Premiere League, the K-1 events, etc… are very valuable for all athletes. These events are a great opportunity for competitors to compete against high level athletes that can only be found in European and World Championships. What do you need to work with Sandra Sanchez and Damian Quintero between now and the 2020 Tokyo Olympics to best position them for a gold medal? Well, we need to remember that it is all very new, specially for kata people. Kumite people have a reference with other combat sports like Tae Kwon Do, but kata people don’t. The first thing is to qualify for the Olympics. For that, year 2018 will be the key. We must be at the top of the world ranking like number 1 in the world. We’ll focus mainly on the European and World Championships. After those, we’ll calculate very well the events where we are going to compete because that will be the key factor: make sure that we dosify the training and the competition load to arrive to Tokyo 2020 at the very top of our possibilities. What can coaches do to instill a love of the sport in their athletes? It is important that the athletes truly enjoy what they do. They need to feel the positiveness of the training and always remember that all the years spent in competition will remain as great memories in their future. Along the way, they will meet friends, have new experiences, and grow as human beings. They need to realize that they are very fortunate people…they are doing what the love the most…training karate! Finally, an open-ended question for you: why do you love coaching karate?